Did you know that Christopher Columbus did not discover America, or that after a Greek scholar found a way of measuring the Earth, it was 1300 years before the rest of the world accepted his figures? Or that nitrocellulose explosive was discovered when an inventor spilt some chemicals in the kitchen and blew up his wife’s apron? 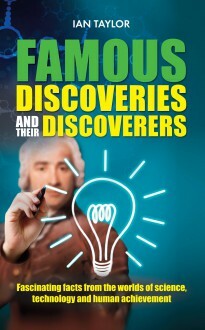 Famous Discoveries and their Discoverers, by a former career scientist deals with a fascinating range of discoveries over the centuries, related to everything from geology and astronomy to atomic theory, zoology and men who discovered continents. It also gives revealing information about the colourful lives of some of the people whose findings changed the world, and often their own lives, for ever.